The teacher in Year 5DJ is Mr Jokhi. The teaching assistant is Miss Heron. In Maths we have been looking at place value and addition and subtraction up to the millions. In English we have been reading Kensukes Kingdom and learning how to write descriptive paragraphs and diary entries. 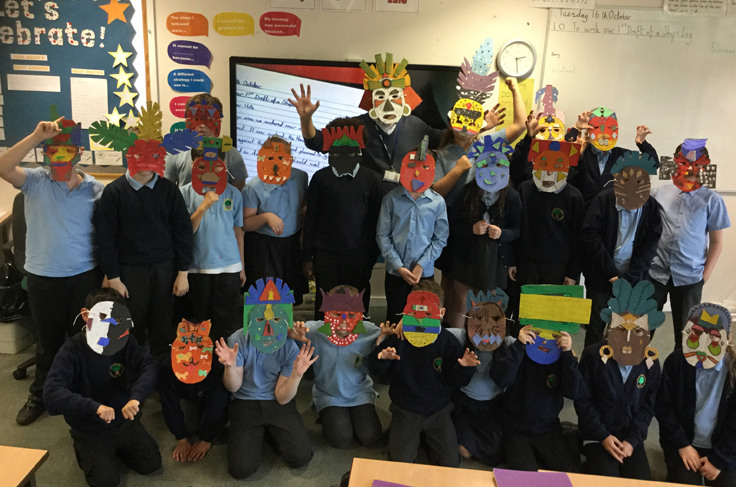 In Topic we have been learning all about the Mayans. In Autumn 2, our topic was all about the human life cycle and how we change as we age: we looked at how our bodies grow and develop and how old age affects us as well as how to keep ourselves healthy. We also looked at how other cultures celebrated Christmas. In literacy we /Pixar film the Disney used Up! as our inspiration to create a character biography and later we went on to write a dramatic action story about a struggle between a secret agent and a pigeon on its quest to eat a delicious bagel. In Spring 1, our topic was science based we have been learning all about forces – looking at air resistance, gravity and water resistance; we have created and tested our own parachutes to protect our Lego people! along with the history of forces and the famous and important scientists such as Sir Isaac Newton and Galileo Galilei. In literacy, we have also been learning about deforestation and the devastating global impact it has on our planet. We have learnt to write persuasive letters and have started a setting description describing a tropical rain-forest using our senses as well as figurative language. Next term our topic focus is local history so we will be looking at the local history of Dukinfield and its importance in its relation to Manchester. How it has developed from a small village to a large town and its role in the industrial Manchetser. In science we will also be looking at materials and their properties. Each and every child in class has reading book that is chosen specifically at their level of reading that they can take home. Throughout the school the pupils are expected to regularly practise reading at home (15 mins daily minimum). Each child will be listened to read at least once per week by an adult. In order to further help accelerate the every childs reading they must also complete a reading quiz about their specific reading book that will take place on the computers before a child can take home a new book. Finally, we know that accidents can happen from time to time and books can get damaged or lost so if that is the case please inform the school. We may ask you to pay a small fee to cover the cost of a replacement book. We use Dojo points in school to reward positive behavior. You can see the points your child has been awarded. Please sign up and stay in touch as Year 5DJ currently only has a 67% sign up. We have P.E. EVERY Tuesday and Thursdays. For P.E. children will need a plain white t-shirt, black shorts and black pumps in a bag. Physical fitness is essential in school and also compulsory. A healthy body and a healthy mind. This half term we will be researching the local history of Dukinfield and its famous places and people. We will also be looking at materials and their properties.